TORONTO -- Torstar Corp. lost $18.8 million in its third quarter, as the newspaper and digital publisher experienced a 13 per cent decline in revenue led by weaker print advertising. Revenue after eliminating sales between different parts of the business totalled $126.4 million, down from $145.9 million -- a bigger decline than analysts had estimated. 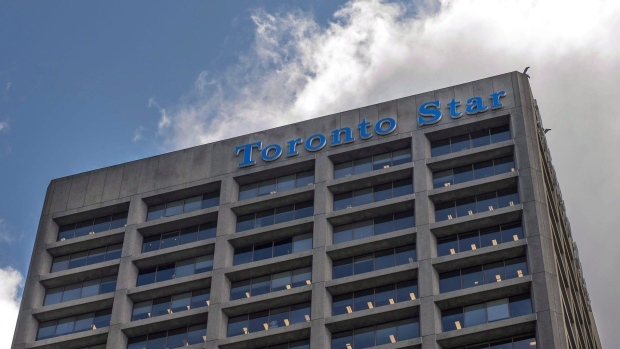 Torstar CEO John Boynton told analysts that print advertising was more difficult to get during the quarter compared with earlier this year -- when the company had seen some strengthening of local advertising. However, he said Torstar's base of subscribers is proving to be resilient and an increasingly important part of the company's strategy for dealing with a change in consumer and advertiser use of media. Revenue from subscribers grew to nearly $29.8 million compared with $29.3 million a year ago, edging out digital advertising as Torstar's second-largest revenue stream after print advertising. Subscriber revenue represented 21 per cent of the total (up from 18 per cent) compared with 20 per cent from digital advertising, 19 per cent from distributing flyers and 33 per cent from print advertising (down from 38 per cent). "We are making very good progress on many fronts," Boynton said during a conference call with financial analysts. "The mix of our business continues to change, with some things eroding faster than others but also some things getting added." Since Boynton joined the company in March 2017, Torstar has undertaken a number of initiatives including an increased emphasis on data analytics -- to better match advertising with consumers -- and the introduction of a paywall at thestar.com, the website for its flagship Toronto Star newspaper, on Sept. 27. The paywall limits the number of digital articles and other content that can be accessed by non-subscribers while a subscription provides access to a broader selection of content from the Toronto Star and other sources. Shortly after the third quarter ended on Sept. 30, Torstar added articles from its recent acquisition of iPolitics -- an Ottawa-based subscription news service -- to complement its own coverage of provincial and federal politics. "By including iPolitics consumer content in our basic package, we will further strengthen the value and appeal of that digital subscription offering," Boynton said. Boynton also announced Wednesday that the Toronto Star was adding a new business-oriented premium service that will provide full access to Wall Street Journal stories and more Canadian content from Bloomberg and The Canadian Press. He told analysts that it's too soon to provide financial targets for its subscriber offerings, but Boynton added that "every single launch is exceeding our expectations, so we're feeling very encouraged despite the print advertising declines." Torstar management said there's been progress on containing costs, but the company reported an increased third-quarter net loss equal of 23 cents per share, some of it related to acquisitions. The result compared with a loss of $6.6 million or eight cents per share in the same quarter last year. On an adjusted basis, Torstar lost 22 cents per share in the quarter compared with an adjusted loss of eight cents per share in the third quarter of 2017. Analysts on average had expected a loss of eight cents per share and $129 million of revenue, according to Thomson Reuters Eikon.